The eight straight wins on the past performance sheet for Escape Clause would catch the eye of any handicapper. The abbreviations for the tracks of the 4-year-old Canadian-bred filly's success, however, might tax the acumen of even veteran Southern California Daily Racing Form students. AsD – Assiniboia Downs, Winnipeg, Manitoba, venue for victories in June, July, August and September by a combined margin of 19 lengths and wins Nos. 1, 3, 4 and 6 in the streak. Cby – Canterbury Park, Shakopee, Minnesota, site of Win No. 2, by 2 ¾ lengths. NP – Northlands Park, Edmonton, Alberta, where win No. 5 was notched on August 25 in monetarily the biggest race of the string, a $75,000 stakes. 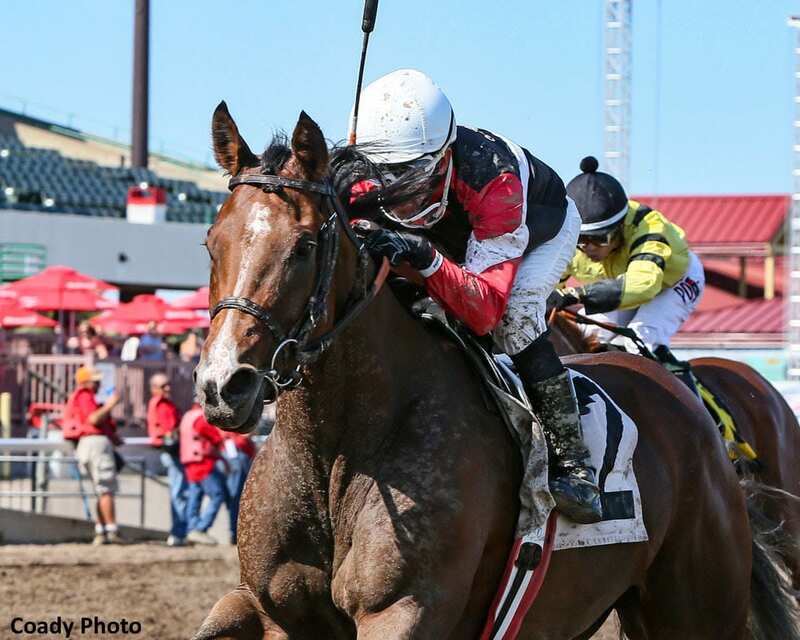 CtD – Century Downs, Calgary, Alberta, where Escape Clause ran off to 10 ¾ and nine-length wins last month before migrating south to the winter quarters in Phoenix of her owner/trainer Don Schnell. Schnell, who has been training thoroughbreds for 40 of his 66 years, hasn't seen the likes of what the filly, purchased for $3,791 at a sale in Manitoba (her sire, Going Commando stood for $990) has done. Escape Clause enters the $75,000 Kathryn Crosby Stakes, feature of Friday's opening program of fall racing at Del Mar, with a career record of 17 wins from 24 starts and earnings of $296,840. Despite the winning streak, she's 20-1 on the morning line in a field of 12 for the mile run that will be her turf racing debut. “Some of them (streak wins) have been against not exactly quality horses,” Schnell conceded. “One time they refused to run against her and so I put in another of my horses to run against her and took first and second money.” That was a $20,000 race at Assiniboia in August. “She seems to be getting better and better. She won her last race by 9 ½ lengths and set a track record, so we were looking at a couple of places for her,” Schnell said. “I thought this race might be a good spot. But it did turn out to be quite a bit tougher than I expected. The field from the rail out: : Gliding By (Evin Roman, 8-1), Pyscho Sister (Edwin Maldonado (20-1), Miss Southern Miss (Assael Espinoza, 20-1), Excellent Sunset (Mario Gutierrez, 8-1), Shehastheritestuff (Geovanni Franco, 20-1), Quebec (Rafael Bejarano, 9-2), Way to Versailles (Flavien Prat, 7-2), Tonahutu (Gary Stevens, 6-1), Escape Clause (Ruben Fuentes, 20-1), Sweet Charity (Mike Smith, 6-1), Last Promise Kept (Drayden Van Dyke, 5-1), Pantsonfire (Kent Desormeaux, 12-1). Also eligible: Birdie Gold (Mike Smith, 10-1). This entry was posted in Racing and tagged assiniboia downs, canterbury park, century downs, Del Mar, del mar thoroughbred club, don schnell, escape clause, kathryn crosby stakes, northlands park, ruben fuentes, Southern California by Del Mar Thoroughbred Club. Bookmark the permalink.